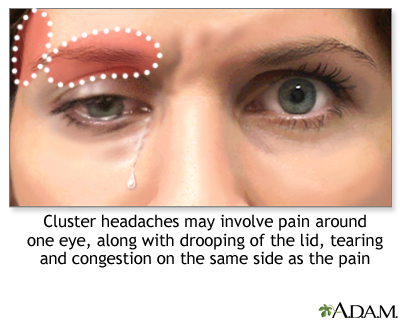 A cluster headache is a type of headache. It is one-sided head pain that may involve tearing of the eyes, a droopy eyelid, and a stuffy nose. Attacks occur regularly for 1 week to 1 year. The attacks are separated by pain-free periods that last at least 1 month or longer. Cluster headaches may be confused with other common types of headaches such as migraines , sinus headache, and tension headache . Doctors do not know exactly what causes cluster headaches. They seem to be related to the body's sudden release of histamine (chemical in the body released during an allergic response) or serotonin (chemical made by nerve cells). A problem in a small area at the base of the brain called the hypothalamus may be involved. Tests, such as an MRI of the head , may be needed to rule out other causes of the headaches. Surgical treatment may be recommended for you when all other treatments have failed. One such treatment is a neurostimulator. This device delivers tiny electrical signals to a certain nerve near the brain. Your provider can tell you more about surgery. Cluster headaches are not life threatening. They usually do not cause permanent changes to the brain. But they are chronic, and often painful enough to interfere with work and life. Ferri FF. Cluster headache. In: Ferri FF, ed. Ferri’s Clinical Advisor 2016 . Philadelphia: PA: Elsevier Saunders; 2016:347. Petersen AS, Barloese MC, Jensen RH. Oxygen treatment of cluster headache: a review. Cephalalgia . 2014;34:1079-1087. PMID: 24723673 www.ncbi.nlm.nih.gov/pubmed/24723673 . Silberstein SD. Headache management. In: Benzon HT, Rathmell JP, Wu CL, Turk DC, Argoff CE, Hurley RW, eds. Practical Management of Pain . 5th ed. Philadelphia, PA: Elsevier Mosby; 2014:chap 30. Weaver-Agostoni J. Cluster headache. Am Fam Physician . 2013;88:122-128. PMID: 23939643 www.ncbi.nlm.nih.gov/pubmed/23939643 . 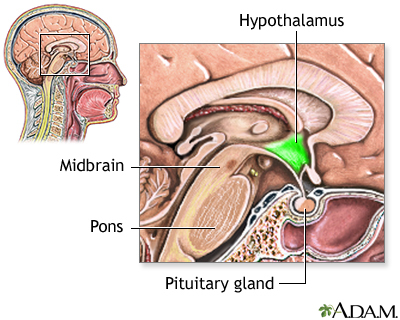 The hypothalamus is a highly complex structure in the brain that regulates many important brain chemicals. Malfunction of this area of the brain may give rise to cluster headaches.